The National Noh Theatre (Kokuristu Nō Gakudo) was presenting a double bill of the kyōgen IRUMAGAWA and the noh play FUJI. Just as in Ancient Greece a trilogy of tragedies would be followed with a satyr play, a comic play on similar subject matter, so a programme of noh plays would be interspersed with their comic equivalent, the kyōgen. When one of the various schools of noh has their monthly or bimonthly presentation, it is the norm to present the kyōgen first followed by the noh play. The National Noh Theatre is a beautiful modern building in whose auditorium one finds the traditional wooden noh stage with its own roof. This consists of a long veranda on house left leading to the main square playing area with its four pillars and its shingled roof and stylizing pine tree painted on the back wall. The only direct entrance to the square area is a door in the house right corner so low that a kneeling man must bend his head to get through. Otherwise, the main entrance to the stage is via the long veranda or “hashigakari“ whose opening to the backstage is covered by a bold rainbow-patterned cloth hoisted and dropped for every entrance and exit. While noh has had more influence on Western drama, primarily through the translations of Arthur Waley, there is no doubt that kyōgen are more accessible in performance. Unlike noh, there is no musical accompaniment (since there are no great emotions to heighten) and the actors wear no masks. IRUMAGAWA is a kind of variant of our story of a Cretan saying that “All Cretans are liars”. In this case, a feudal lord trying to cross a river encounters a man who speaks in the Iruma dialect. Since it is well known that all people who speak in this dialect mean the opposite of what they say, the lord proceeds to do the opposite of whatever the man tells him--whence the humour--until the man makes the mistake of speaking in his own non-Iruma dialect and all gifts the lord gave him in jest are lost. The title of FUJI , attributed to Saami Yasukiyo (1382-1458), refers not to the famous mountain but to the wisteria. Here musicians and chanters share the stage with the actors under the undimmed light of the auditorium. The only prop, ceremoniously brought in along the “hashigakari“ is a pine tree intertwined with wisteria. In the plot, such as it is, a priest stops on his journey to the Zenkoji temple to admire the beauty of Tago Bay. The priest recites an ancient poem of being moved by seeing withered wisteria rather than the pine. At this, a supposed village woman enters from behind the hoisted curtain. This was one of the most chilling entrances I have ever seen. Frozen in a position with arms half-outstretched and wearing a white wooden mask, this “woman” using the sliding footsteps (“suriashi”) peculiar to noh, seemed to glide in slow motion along the “hashigakari” towards the main stage. As is revealed later, this is no village woman but rather the spirit of the wisteria itself. Watching her glide along to the flute music that usually accompanies supernatural occurrences was truly eerie. I could easily imagine that a being of some other nature had suddenly entered our world. The “village woman” has entered to chide the priest for mentioning the wisteria only in its withered state and not noting its scent which pervades all the air. After her departure, the priest tries to call her back by chanting sutras for her. This succeeds and the woman re-enters as mysteriously as before now in her true identity as the wisteria spirit in a magnificent white costume and wearing a wisteria crown. What follows is a half-hour-long dance by this spirit to the accompaniment of a chorus chanting the meaning of her dance. Even after having read the English-language plot summary several times, I found it almost impossible to follow the meaning of the dance. Japanese classical dance which is so inward, so dependant on poses and the ways of holding parts of clothing and fans to communicate its meaning requires more study that I have ever had the chance to give it. Nevertheless, the actors playing this role communicated such an intensity of feeling that I was mesmerized throughout the performance. Noh was always intended for an elite audience with a highly esoteric knowledge and it remains so today. Yet it behooves anyone interested in theatre to experience one of these plays to put into context all the glib, uninformed references to noh one finds in Western criticism. Note: A version of this review appeared in the TheatreWorld (UK) 2000-05-28. 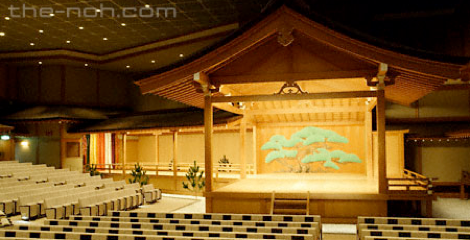 Photo: The stage of the National Noh Theatre, Tokyo. ©2013 National Noh Theatre.